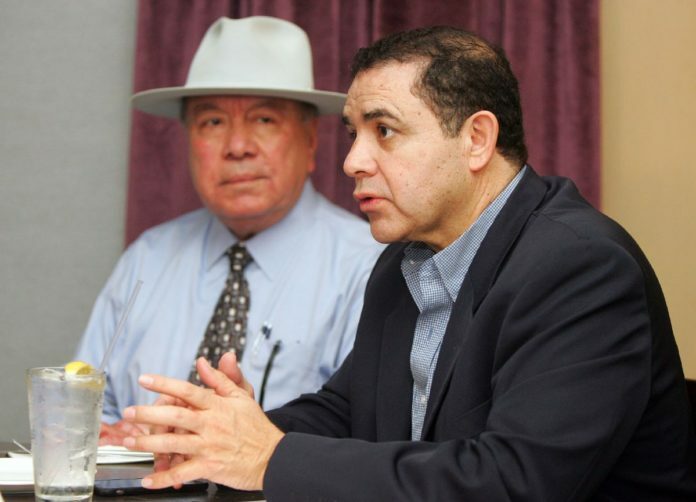 U.S. Rep. Henry Cuellar, D-Laredo, right, and State Sen. Juan "Chuy" Hinojosa, D-McAllen, speak to the media about DACA and other issues facing the nation at Palenque Grill on Monday in McAllen. McALLEN — With the threat of a second government shutdown in as many months mere days away, congressional leaders are hunkering down to negotiate a deal on protection for more than 700,000 undocumented youth this week. U.S. Rep. Henry Cuellar, D-Laredo, held a meeting with the media Monday to discuss last week’s bipartisan negotiations with President Donald Trump and other congressional leaders on the Deferred Action on Childhood Arrivals program, and of his hope of coming to a deal by Friday’s government spending deadline. Cuellar said a deal on DACA is possible, but whether this happens by Friday remains to be seen. Either way, Cuellar said he expects to avoid a shutdown of the government with the introduction of another continuing resolution, which would buy them about a month to continue negotiations. But, he said, Republicans have not stood by the four issues agreed upon in the meeting with the president. The four issues reportedly settled on, referred to as Phase 1, are a replacement for DACA, border security, “chain migration,” and diversity VISAs. Instead, he said Republicans recently added more than 20 items they wanted to include in the talks, saying they would fall under the umbrella of border security issues. “When I asked (Republicans), ‘What are you doing?’ They said it’s border security — it’s not border security,” Cuellar said. Trump, who rescinded DACA in early September, appeared optimistic about a deal for recipients — otherwise referred to as Dreamers — just last week during the aforementioned meeting with bipartisan members of congress. But his tone on the matter appeared to shift, when U.S. District Judge William Alsup in San Francisco temporarily blocked the Trump administration’s decision to phase out the program. That ruling came down hours after a meeting between Trump, U.S. House Appropriations Committee members and the Homeland Security Subcommittee to discuss DACA which appeared to end with optimism from both the president and those attending the meeting. Some Democrats have threatened to vote against legislation to extend government funding, which expires Friday, unless protections for the Dreamers are included. Trump said Democrats aren’t for securing the border or stopping the flow of drugs, but are for taking money away from the military. The congressman said he and other representatives are working together on a solution and disputed Trump’s assertion. Cuellar’s appearance Monday comes on the heels of Majority Whip and Sen. John Cornyn’s visit to the Rio Grande Valley, in which he both criticized and lauded the president on a myriad of topics, including the North American Free Trade Agreement and the tax-overhaul bill. Cornyn, who made a few stops during this stay in the Valley on aFriday, said he felt optimistic about a deal for Dreamers. Although he was previously open to the idea of levee walls in some form in Hidalgo County, Cuellar said he would be opposed to the idea in Starr County where 32 miles of bollard wall is proposed. The congressman said he would not be in favor of any fencing or wall that would harm the environment or put residents in a flood hazard — a concern of Starr County residents who live in areas government officials have preliminarily identified for wall construction. “I again would ask for some redesign of what they want to do,” Cuellar said before stressing that walls should be kept from “environmentally sensitive areas,” such as Santa Ana, the National Butterfly Center and Bentsen-Rio Grande Valley State Park. Bipartisan negotiations will continue throughout the week with the hope of reaching middle ground on a replacement for DACA.